The Industrial Revolution had a profound effect on the world of books: mechanization made it possible to produce thousands of copies of a work quickly and inexpensively. The upside of mass production was the increased availability and affordability of books; the downside was shoddy materials and workmanship. 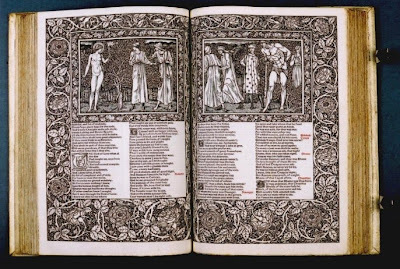 When I first came to work in the rare book business, I was astonished to find that many of the incunables (printed before 1500) in our inventory had brighter, fresher leaves than those in 19th century books. The reason was simple: the early books were printed on a higher quality paper than the mass-produced books. The Industrial Revolution caused a backlash against mass production in many areas of British society. 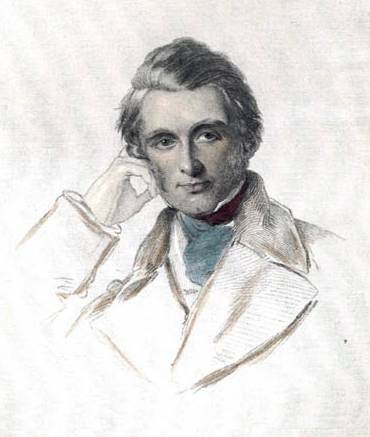 In the influential essay "The Nature of Gothic," John Ruskin warned, "the great cry that rises from all our manufacturing cities, louder than their furnace blast, is all in very deed for this—that we manufacture everything there except men; we blanch cotton, and strengthen steel, and refine sugar, and shape pottery; but to brighten, to strengthen, to refine, or to form a single living spirit, never enters into our estimate of advantages." Rusking saw the separation of intellectual and manual activity as a reinforcement of class distinctions: "gentlemen" believed manual labor was beneath them, and working men, turned into automatons by the factories, had no ownership of or pride in their work. 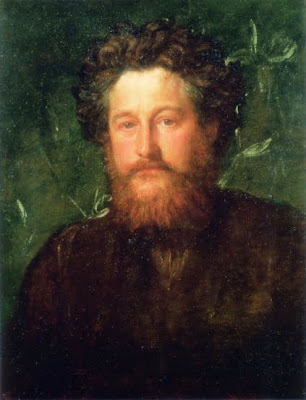 William Morris by G. F. Watts (1870). Portrait courtesy of Wikimedia Commons. One of Ruskin's dispciples was William Morris (1834-96),who, among many other accomplishments, was the most important figure in the revival of printing in England at the end of the 19th century. As Feather says, "Morris was a remarkable man in many ways; at Oxford, he had been under the influence of the Pre-Raphaelites, and had carried this influence into his subsequent work as an architect and designer." Morris "looked back to the Middle Ages as a period when free craftsmen, untrammeled by capitalism, pursued their avocations and produced objects which were both useful and esthetically worthwhile. He became involved with the Arts and Crafts Exhibition Society, which sought to promote guild socialism to revive this lost world. 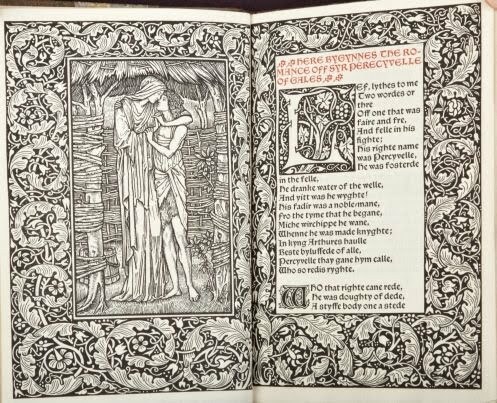 The Kelmscott Press was a product of this ethos, the immediate influence being Emery Walker's famous lecture on typography to the Arts and Crafts Exhibition Society in November 1888." Seeking to revive what he considered to be the purity of printing's first century, Morris founded the Kelmscott Press in 1891, marking the beginning of the modern private press movement. 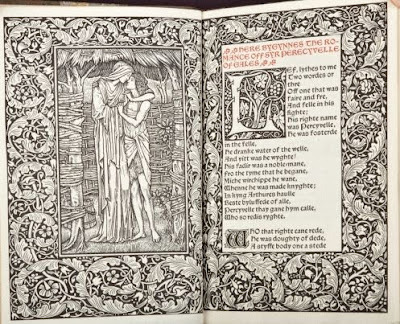 In his "Note" about the press, which took the form of the final Kelmscott book, Morris explains that he "began printing books with the hope of producing some which would have a definite claim to beauty, while at the same time they should be easy to read and should not dazzle the eye, or trouble the intellect of the reader by eccentricity of form in the letters." 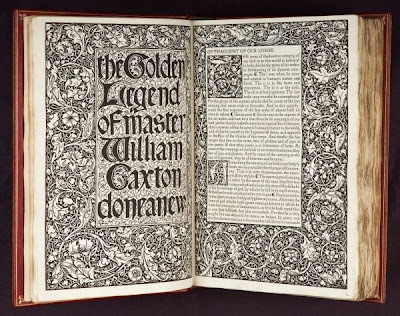 This was an understatement of the first order: his press produced 53 titles in 66 volumes, all of them notable in some way, along with three memorable typefaces: Golden, Troy, and Chaucer. 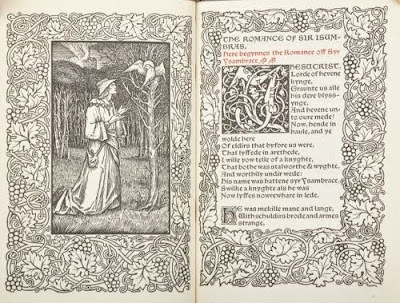 Many of the Kelmscott Press books were decorated with woodcut "white vine" borders designed by Morris, and were sometimes illustrated by his dear firend, the Pre-Raphaelite painter Edward Burne-Jones. The type was cut and set by hand, the paper made by hand, and the leaves printed by hand. 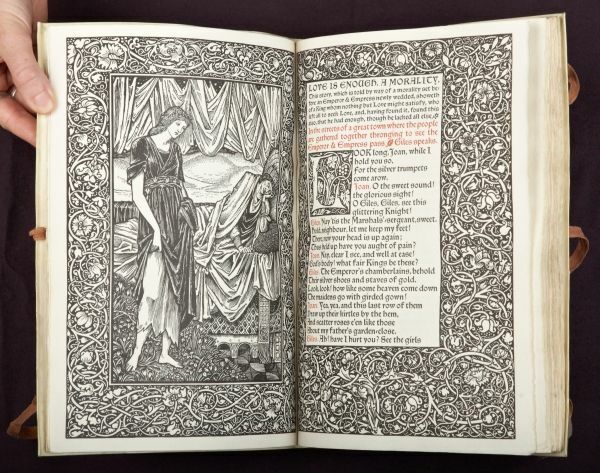 One of the Kelmscott books, a printing of Morris' Gothic Architecture: A Lecture for the Arts and Crafts Exhibition Society, was printed in public as a "moving exhibit" during the 1893 Arts and Crafts Exhibition held in the New Gallery, becoming one of the exposition's most popular attractions. It was also the Kelmscott book of which the most copies (1,500) were printed. The labor intensive printing process limited the run of most books to between 250 to 500 copies on paper, with perhaps another dozen or so "deluxe" copies printed on vellum. Kelmscott focused on printing the work of contemporary poets like Dante Gabriel Rossetti and Tennyson, English classics, and medieval literature. 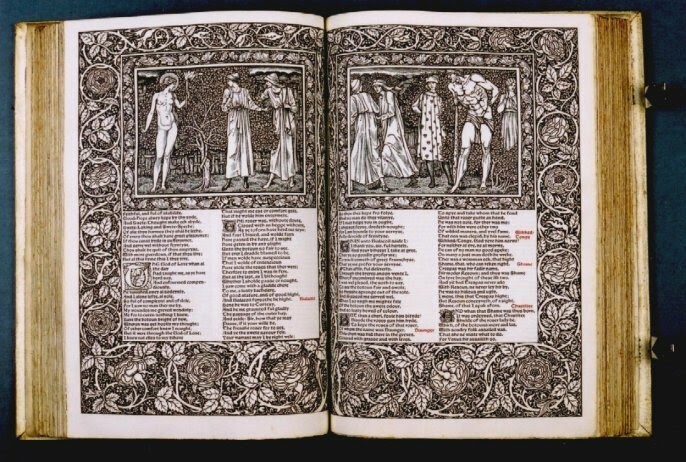 The great work of the press was the Kelmscott Chaucer, a reprinting of the works by the author of the Canterbury Tales, lavishly illustrated with 87 engravings by Burne-Jones and borders by Morris. A pigskin binding in the medieval style was crafted by Douglas Cockerell. Four years in the making, it remains one of the three greatest productions of the modern private press movement. Morris not only left a legacy of some of the most beautiful books ever printed, he sparked a movement that prospered in the first quarter of the 20th century and that lingers on today, as we will discover in upsoming weeks. Except where otherwise noted, all images courtesy of Phillip J. Pirages Fine Books & Manuscripts.